Notes: If driving aim for Tunnel Lane accessed from North Warnborough Street as you’ll find a lay-by here. Avoid following your Sat Nav to Mill Lane. Castle is poorly signposted. The remains of the curtain wall of the octagonal Keep of this once major castle. The fine stone has gone and only the flint core remains. Little else remains but visiting involves a short but pleasant walk along the Basingstoke canal. Castle is owned and managed by Hampshire County Council. 1. King John visited Odiham in 1204. It was probably this visit that made him consider the site suitable for a castle. 2. Edward I spent the Christmas of 1302 at Odiham Castle. Built on the banks of the River Whitewater, Odiham Castle was originally built as a hunting lodge. Besieged by the French in 1216, it was later rebuilt in style with an impressive octagonal Keep. Later it was owned by the rebel Simon de Montfort, witnessed further trouble during the reign of Edward II and was used as a prison to house David II of Scotland. Odiham Castle was built between 1207-14 at a cost of over £1,000. A particularly grand castle in its day and one of only three castle built from scratch by King John, its primary use was as a hunting lodge. However, with the turbulence of King John's reign, it soon became embroiled in military action. In 1215, on request from John's rebellious barons, Prince Louis of France invaded England in an attempt to overthrow John and seize the throne. Louis attacked Odiham in 1216 and placed the castle under siege; after two weeks the garrison (of only thirteen men) surrendered. The war with the French was defused in 1216 by the timely death of King John (at Newark Castle). With the accession of his nine-year old son, Henry III, the Barons withdrew their support for Louis and the first Barons War petered out. Odiham Castle, which had suffered some damage in the siege, was repaired and enhanced (the octagonal Keep was added at this time). In 1236 Odiham Castle was granted to the King's sister, Eleanor of Pembrokeshire. She married Simon de Montfort, Earl of Leicester who made the castle one of his primary residences. But in 1263 he rebelled against the King starting the second Barons War. Initially having success - at the Battle of Lewes (1264) he captured Henry and his son (the future Edward I) - he was soundly defeated and killed at the Battle of Evesham (1265). Eleanor was exiled and Odiham Castle was confiscated by the Crown. Odiham remained a Royal castle until the reign of Edward II when it was granted to Robert le Ewer. When he fell out of Royal favour the castle was reclaimed but he attempted to re-take it by force causing some damage to the structure in 1322. Repairs were made and Edward III granted the castle to his wife, Philippa of Hainault. During this time the castle was also used as a prison for King David II of Scotland who had been captured at the Battle of Neville's Cross (1346). 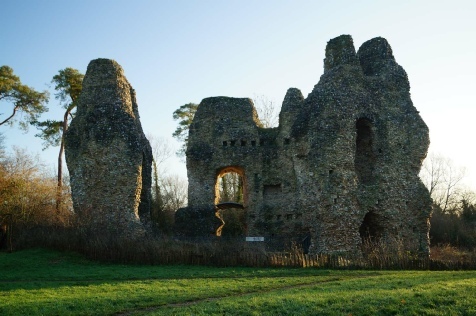 By the mid-fifteenth century Odiham was no longer defendable and by the early seventeenth century was ruinous - the dressed stone that made it such a fine castle was robbed leaving only the flint core visible today. The construction of the Basingstoke Canal in 1792 destroyed much of the bailey.